American civilian surveillance satellite. 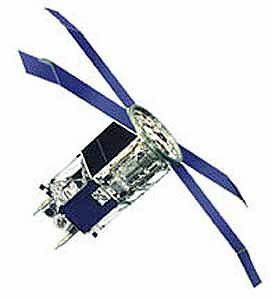 The SeaStar satellite carries the SeaWiFS instrument which was designed to monitor the color of the world's oceans. Earth observing satellite built by Orbital Sciences Corporation (OSC) for OrbImage (for NASA) => GeoEye, USA. Launched 1997. Used the PegaStar bus. AKA: SeaStar;SeaWiFS. Status: Operational 1997. First Launch: 1997-08-01. Last Launch: 1997-08-01. Number: 1 . Gross mass: 309 kg (681 lb). Various ocean colors indicated the presence of different types and quantities of marine phytoplankton, which played a role in the exchange of critical elements and gases between the atmosphere and oceans. The satellite Orbview-2 would monitor subtle changes in the ocean's color to assess changes in marine phytoplankton levels, and would provide data to better understand how these changes affected the global environmental and the oceans' role in the global carbon cycle and other bio-geochemical cycles. Complete coverage of the Earth's oceans would occur every two days. The NASA-sponsored mission was contracted as a "data buy" from a Orbital Sciences Corporation, who would build, launch, and operate the satellite, and then sell data from the satellite to NASA. NASA would retain all rights to data for research purposes, while would OSC retain all rights for commercial and operational purposes. The mission was a follow-on to the Coastal Zone Color Scanner (CZCS). The spacecraft was nadir pointing, 3-axis stabilized to 0.5 deg with 0.08 deg knowledge using 2 momentum wheels and torque rods. Attitude determination was via redundant sun sensors, horizon sensors, and magnetometers. A hydrazine propulsion system with four 1-lbf thrusters was used for orbit raising and orbit maintenance. A nitrogen propulsion system provided stabilization during launch. Downlink used L-Band at 665.4 kbps, and S-Band at 2 Mbps. Uplink used S-Band at 19.2 kbps. Redundant GPS receivers allowed orbit determination. Four deployed solar panels with zenith-facing cells and two body-mounted side-facing solar panels produced 165 watts orbit-average after 5 years. A 160 MBytes solid state recorder was used for data storage. NASA paid $ 43 million for the satellite. Launch was 4 years late to original plan. Family: Civilian surveillance satellite, Sun synchronous orbit, Surveillance. Country: USA. Launch Vehicles: Pegasus, Pegasus XL. Launch Sites: Point Arguello WADZ. Agency: NASA, OSC, Hughes. Bibliography: 2, 4, 12921. 1997 August 1 - . 20:20 GMT - . Launch Site: Point Arguello. Launch Complex: Point Arguello WADZ. Launch Pad: Aircraft from Vandenberg.. Launch Platform: L-1011. LV Family: Pegasus. Launch Vehicle: Pegasus XL. Orbview-2 - . Payload: Seastar. Nation: USA. Agency: Orbimage. Manufacturer: Germantown. Program: Orbview. Class: Surveillance. Type: Civilian surveillance satellite. Spacecraft Bus: PegaStar. Spacecraft: Orbview-2. USAF Sat Cat: 24883 . COSPAR: 1997-037A. Apogee: 708 km (439 mi). Perigee: 707 km (439 mi). Inclination: 98.20 deg. Period: 98.90 min. Air dropped in Point Arguello WADZ..